If your modern family requires a ride that can keep up with their demands then this top of the line Explorer fits the description. Tons of room, abundance of modern features, and off the chart safety ratings makes it perfect for your family! This Explorer is Ford Certified. V6 engine combined with 6-Speed automatic transmission, and 4x4 drivetrain will let you own the road with authority. This Explorer is not just about power. The moment your family steps inside the cabin they will get lost in world of comfort and luxury. Well, why don't you just call us and schedule a visit so we can take you on a test drive in this rocking beauty. 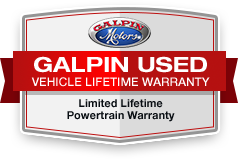 Also let us show you 'Galpin Used Car Difference' during your visit. All figures are EPA estimates. Actual mileage will vary. Kelly Blue Book values are calculated based on the current Retail Book. Pricing analysis performed on 4/11/2019. Fuel economy calculations based on original manufacturer data for trim engine configuration. Please confirm the accuracy of the included equipment by calling us prior to purchase.